There are tons of subscription boxes out there for food now, but did you know there is one just for desserts? 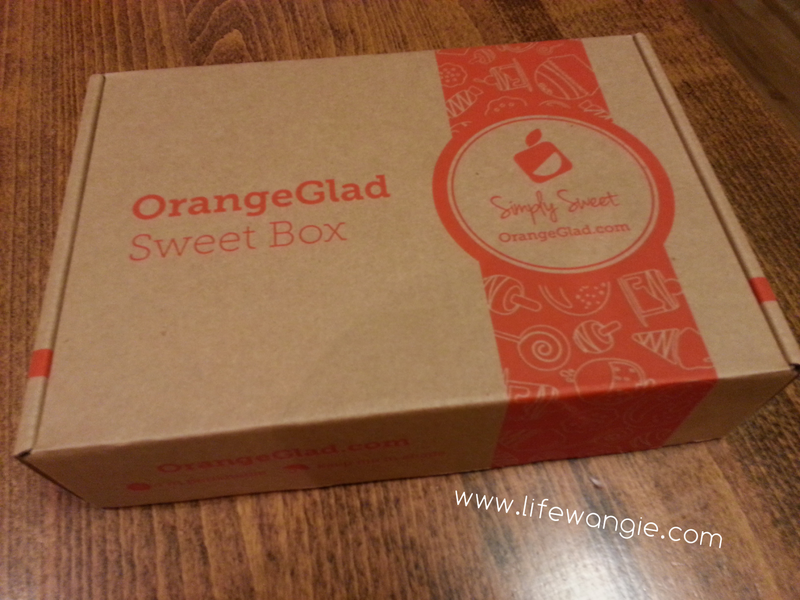 Orange Glad sends out a "gourmet dessert sweet box" every month for $15 a month plus $6.95 a month shipping. You also have the option to double the quantities of the items for another $12 a month, and provide small discounts for longer subscriptions. Orange Glad kindly sent me the February 2014 box to review. The box had an assortment of items related to Valentine's Day. Chocolate was dominant, which is never a bad thing in my book. There were a few different types of cookies as well as a chocolate lollipop and a spoon with a chocolate block on it to make hot chocolate. Super fun! 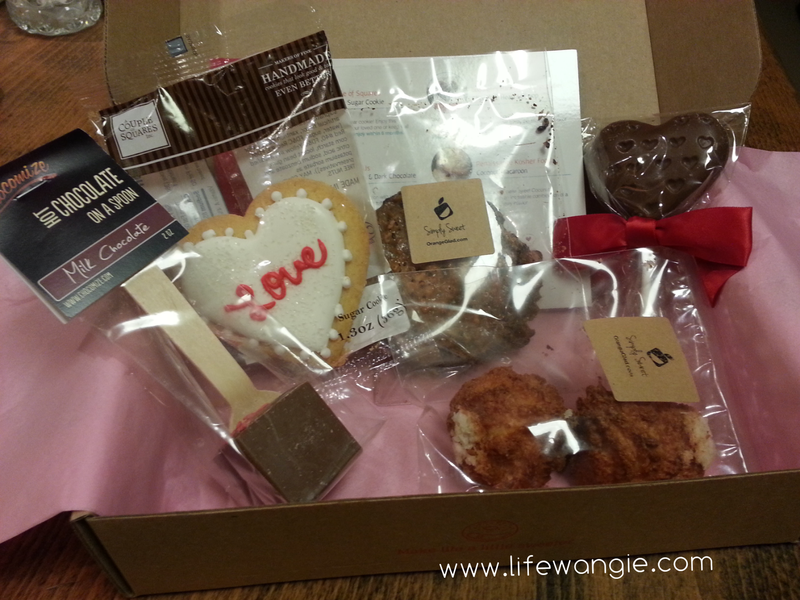 All the items were very high quality with the exception of the heart cookie- It was a bit dry. When I first saw this box and realized each item was basically $3 plus shipping, I was kind of surprised. 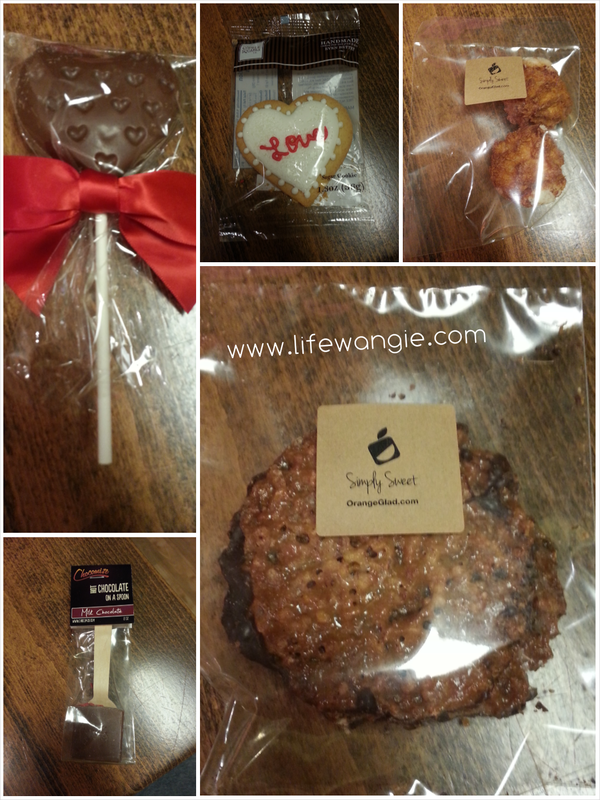 It seemed pricey to me for some of the items, like the dry cookie and the chocolate lollipop. But then I was shopping and saw that nice Valentine's stuff is extremely expensive! I guess being an old married lady who doesn't spend a lot on Valentine's, I am out of touch with the cost of high-end chocolate lollipops. I was also skeptical about getting baked goods through the mail, thinking they might be stale. But only the sugar cookie was stale, and unfortunately that's not unusual even when you buy that type of item in person. Photo note: Sorry for the glare. I didn't realize there was so much glare until I had already eaten most of the snacks and couldn't retake the photos. Good news! The chocolate lollipop was really delicious. The macaroons were really good, too. My favorite thing from the box was the lacey cookie! Orange Glad provided two, and unfortunately I had to share with hubby. But just one of these cookies was so rich I really did not need anything else for dessert. This was probably the most exciting discovery from this box- I probably would not walk into a bakery and order this type of cookie, but it was so good. The brand name is Desserts on Us, and I actually found another flavor on Amazon. I haven't had a chance to try the hot chocolate cube yet. Overall, I do have slight reservations about the monthly cost of Orange Glad because I live in a major city and can walk into a bakery any time and get super fresh, great desserts at a similar price point. However, the discovery aspect was very fun. If you don't live near this type of stuff or you don't have the lifestyle that would afford walking into coffee shops and bakeries on a regular basis, this would be a nice treat for you. It might be nice to get this delivered to the office as well to have sweet treats for your coffee break. There is a gifting option on the site, and they also sell other types of boxes you can order or send as gifts, like a tea box and a cookie box. So if you are in the market for gift boxes or high-end treats, Orange Glad would be a good option.